The unique Poetry In First Languages (PIFL) program developed by Red Room Poetry has announced it will expand its teaching of poetry in First Nations languages beyond New South Wales and into Queensland, the Northern Territory and the Australian Capital Territory this year. The program, which is now in its 2nd year, celebrates, shares and preserves knowledge of First Nations language and culture through teaching school students from Years 3-11 poetry, music, dance and art. With a grant of $43,950 over three years from the Copyright Agency’s Cultural Fund, the PIFL program last year rolled out in New South Wales schools and communities. It successfully engaged more than 350 First Nations students, 500 community members and more than 1,500 non-First Nations young people. The program published more than 300 poems in 11 First Nations languages and reached an audience in excess of 300,000 through live performance, poetry displayed on buses and artistic installations. Poetry in First Languages is led by Gunai poet Kirli Saunders, strengthening connections of First Nations students to country, language and community, empowering pride in their cultural identities, resulting in enhanced wellbeing. Kirli Saunders says, “PIFL offers a one-of-a-kind opportunity because, of the 39 schools and communities we visited in NSW in 2018, just two employed language custodians – so 95% of them had no access to First Nations language programs. The evaluation of the program found that 94% of students reported a positive experience of the program, transitioning from “unsure” or “nervous” at the start of the workshop, to happy, “loud and proud” by the end. “For the elders, poets and custodians, the PIFL program is profoundly affirming as they see their culture and language being passed on to the next generation and witness first-hand the change in the children. It is the ripple effect of programs such as this that will have a positive effect on communities and the wellbeing of young people within them,” added Ms Saunders. The Copyright Agency’s CEO, Adam Suckling, says, “In this UN International Year of Indigenous Languages, it’s enormously important that Aboriginal and Torres Strait Islander people have better access to their own languages. First Nations histories and cultures is a cross-curriculum priority in Australian schools but very few schools and communities have access to First Nations language programs. We are delighted to be able to provide funding that is enabling PIFL to flourish and engage poets, artists, elders and language custodians so the program can be expanded into more states and territories on the way to becoming a truly national program. The expanded 2019 program will offer workshops on Arrernte (Alice Springs, NT), Barkindji (Broken Hill, NSW), Bundjalung (North East NSW), Dharawal (Illawarra NSW), Gadigal (Sydney, NSW), Gumea Dharawal (South Coast, NSW), Gundungurra (Southern Highlands NSW), Ngunawal (Canberra, ACT) and Yugembeh (Brisbane QLD) countries. The poems created at the workshops will be hosted on the Red Room Poetry website and in a variety of public art installations. A Poetry in First Languages Anthology and First Languages Poems to Share resource is being developed and will be released in 2020. 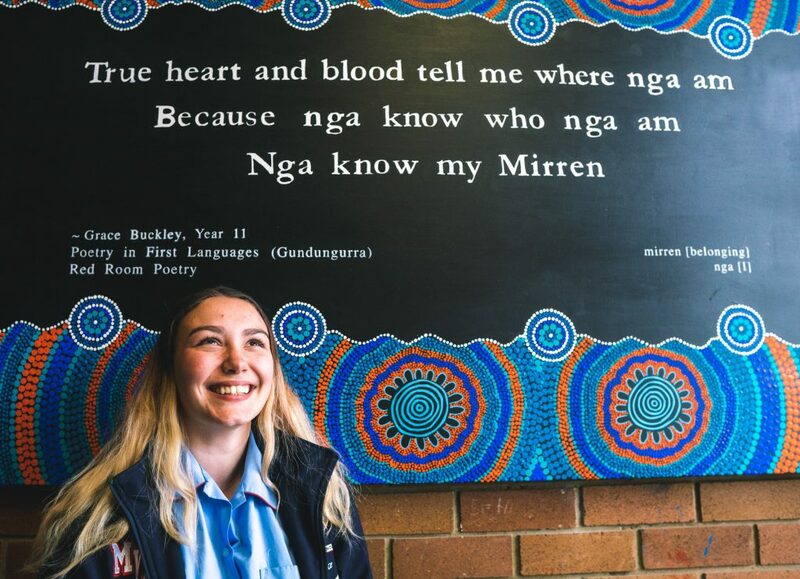 Moss Vale High School student Grace Buckley with her poetry on a mural by artist Rhe Lotter. Photo: Tad Souden. Image Credit: Tumbalong Gatherers lightboxes courtesy of Darling Quarter.